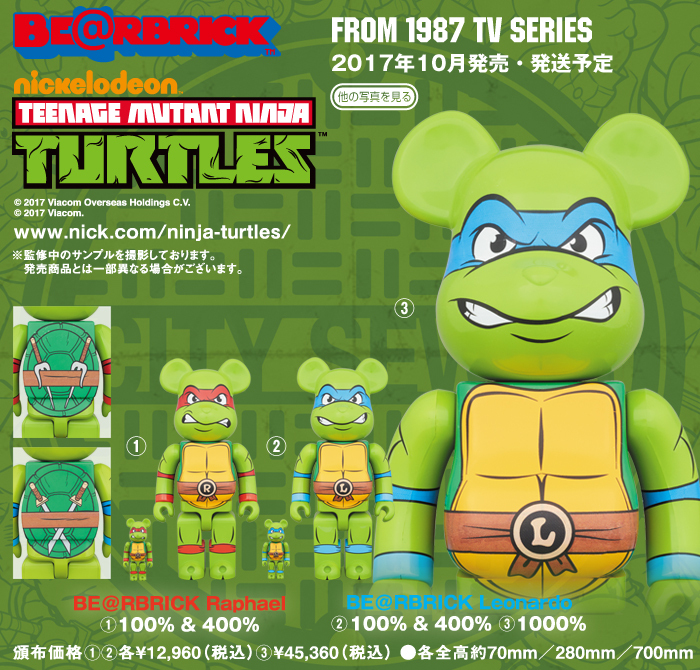 I haven't seen any mention of this previously, it appears that Medicom is including a couple of the classic style Turtle designs in their Bearbricks line. This fall they are suppose to release a Leonardo and Raphael Bearbrick. Both will be available in 100% and 400% and Leo will also be available as a 1000% version. Last edited by tmntman; 10-26-2017 at 10:54 AM. Never a fan of bear brick. I'd be into getting a Leonardo one if they'd done something more original as opposed to the generic faux-retro style-guide stuff. I get the feeling that the TMNT are not quite popular enough in Japan to warrant that. Honestly, I was quite surprised to see that they were doing these. Why are these a thing?!?! Taking a slightly less cynical view than the previous response, Bearbricks have been a fairly long running series in Japan. I believe they started around 2000 or 2001 and have been in production ever since. And over the 35 series or so that they have produced they have included a lot of different licenses into the line. So I don't think these are meant to appeal to TMNT fans. Actually, given that they weren't mentioned here at all, I'd say it's fairly safe to say they AREN't meant for TMNT fans. Rather they are meant for Bearbrick fans who tend to be interested in pop culture in general. They certainly aren't for everyone. But I can't say that they are any dumber than Minimates, Lego minifigures, Kidrobot vinyl figures, or any number of other lines that have done essentially the same thing: reproduced the same body over and over again and just changed the color or graphics that they apply. It looks like something I'd sort of expect to see in Disney park gift shops had Disney bought TMNT. So mostly I want to paint the ears black and paint on a headband. That's my problem with them. At least though with the ones you mentioned there's usually a head, accessory, appendage, add-on piece that's unique. With Bearbricks I see nothing like that. Although a google image search showed a Kermit the Frog Bearbrick with a sculpted Kermit head instead of the bear head that looked pretty official, so now I don't know this world from the upside-down. Anyway, I sure as heck would not collect Bearbricks, but as a TMNT collector I might collect Bearbricks that happen to crossover into TMNT. But they are also ridiculously expensive given what they are, no? So in that case, NO THANKS. How is my reply cynical? Perhaps not, but don't misunderstand, it's not that I'm saying they shouldn't be Fred Wolf related or anything. It'd just be cool if they looked like they did in the cartoon instead of all neon with the yellow buckle & whatnot. Finally a TMNT item I definitely DON'T want. Saves me money! Woot! If I didn't have one of these because of Zebrahead, I would have already thought this was a Disney thing at first glance. Just a quick update if anyone is interested in these. Medicom has now announced that they'll be releasing sets with a 100% and 400% Donatello, a 100% and 400% Michelangelo and a 1000% Michelangelo. Those three sets are listed for July of 2018. So at least it looks like the entire team will be available. Now I just have to decide if I'm hoping for or dreading the possibility of 1000% versions of Raphael and Donatello.